= Chabashira ga tatteru! Ah…dareka ni misetai! Did you know that if you find a tea stalk floating upright in your tea, it is auspicious? You are not supposed to show it to anybody or good luck will leave you. But I will show it to you! It may be hard to see but you see a little tea stalk floating vertically in the middle? 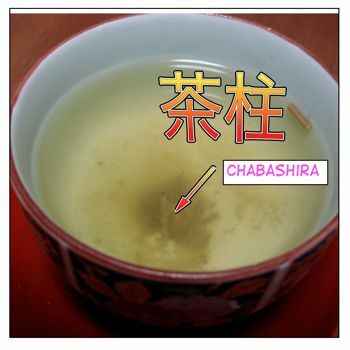 That is called 茶柱 ( = chabashira). Now I shared my luck with you! Today’s lesson is about Japanese superstitions, 迷信 ( = meishin) and 縁起 ( = engi). I guess every country has its own superstitions. Like it or not, many people believe them to a certain level even if none of them are based on scientific facts. Let’s see the word 迷信 ( = meishin), superstition, first. The belief that you will die if you hiccup 100 times in a row is just a superstition. = Watashi wa meishin nante zenzen shinjite imasen. = I don’t believe in superstitions at all. The original meaning of 縁起 ( = engi) came from Buddhism and means that not everything in the world has a specific physical or tangible form. Things are composed by various intangible “reasons” and “conditions”. = Kyou wa shiken nanoni osara wo otoshite shimatta node engi ga warui. = I have to take an exam today, but I dropped a plate and broke it. That’s a bad sign. Note : 落ちる ( = ochiru) and すべる ( = suberu) are taboo words for 受験生 ( = jukensei), students who have been studying to take their entrance examinations. Because the word 落ちる ( = ochiru) means to drop and すべる ( = suberu) means to slip, they can be taken to imply failing the exam. We actually avoid using these words in front of the “sensitive” students who are about to take an important exam. = Ano futari wa kekkon shita bakari dakedo nanka suguni wakareru you na ki ga suru no. = Sonna engi demo nai koto wo iwanai de! There are tons of 縁起物 ( = engimono) in Japan. 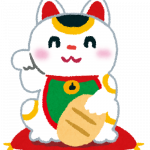 Since it is considered to attract luck and fortune, you’ll often find 招き猫( = Maneki neko) at the entrance of the office, stores or restaurants to beckon more customers and, with them, more money. It is considered to bring good luck, victory or success. 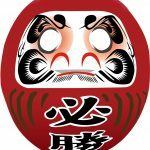 When you buy a daruma it usually has 2 blank eyes. 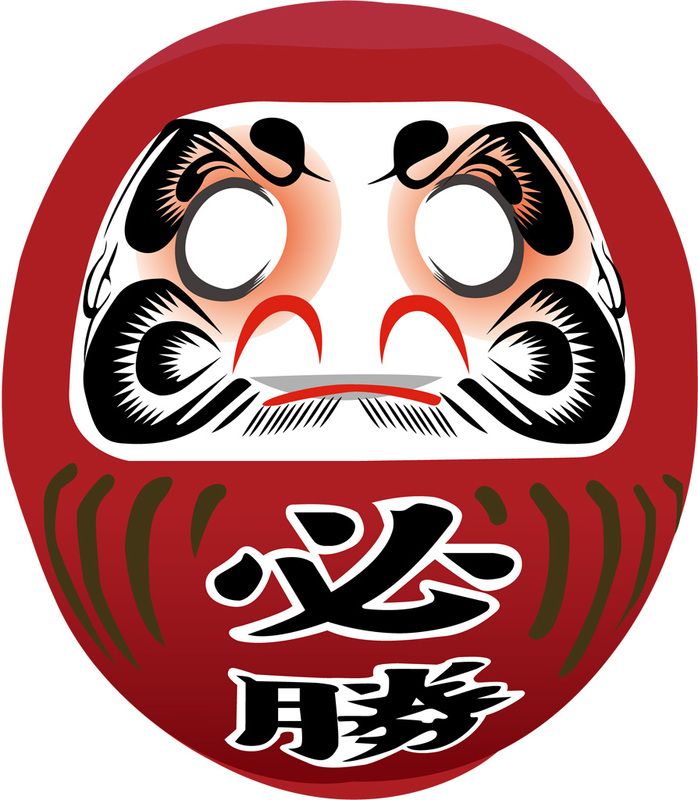 (Some of the daruma dolls come with one eye filled in.) When you make a wish, for example to pass a test, win an election, etc., you fill out one of the eyes — giving it a pupil. When your wish comes true, you fill out the other eye. = Otouto wa shiken no mae ni engi wo katsuide tonkatsu wo tabete ita. = My brother was eating pork cutlets before the entrance examination for good luck. 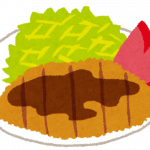 とんかつ ( = tonkatsu) is a pork cutlet. 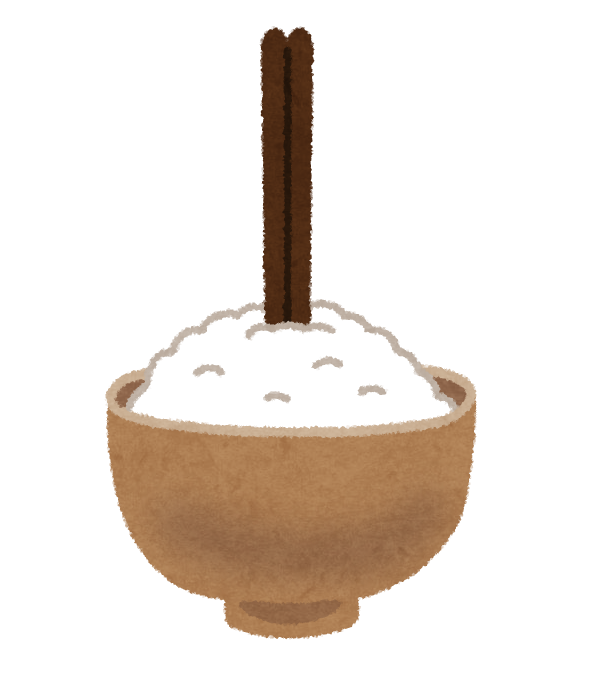 Katsu sounds as 勝つ ( = katsu) which means “to win”. So it relates to an idea of passing the exam. = Juken siizun niwa gen wo katsuida shouhin ga ippai tentou ni narabu. = You will see lots of good luck products regarding success in an examination in the store during the examination period. Note: There are lots of 験を担いだ商品 ( = Gen wo katsuida shouhin) lucky products for passing the entrance examination in Japan. Some products just change their names to target students who are about to take exams. In Western countries, 13 is a bad luck number. But in Japan, number 四 (　=　yon/shi) 4 is considered to be unlucky because one of the pronunciations is シ=shi is the same as the way we pronounce 死（ = shi) , death. Some apartment buildings, hotels or hospitals avoid using the number 4 for the floor number or room number. The number 9 is likewise not very popular because we pronounce it “ku”, and it is the same pronunciation of 苦 ( = ku) pain. So what numbers are considered to be a good luck in Japan? Traditionally 8 is a good-luck number because of its kanji, 八. The bottom part of the kanji spreads out, right? We call it 末広がり ( = sue hirogari), 末 ( = sue) the end, 広がり ( = hirogaru) to spread out, meaning things are getting better. Odd numbers like 七五三 ( = shichi go san), 7,5,3, are also considered to be lucky numbers. That is why we celebrate 七五三 ( = shichi go san). 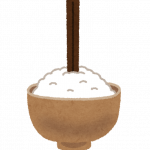 What dates are good for 冠婚葬祭 ( = kankon sousai) ceremonial occasions? 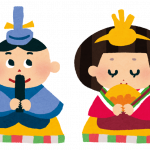 (Note : 冠婚葬祭 ( = kankon sousai) is all the ceremonial events in life. 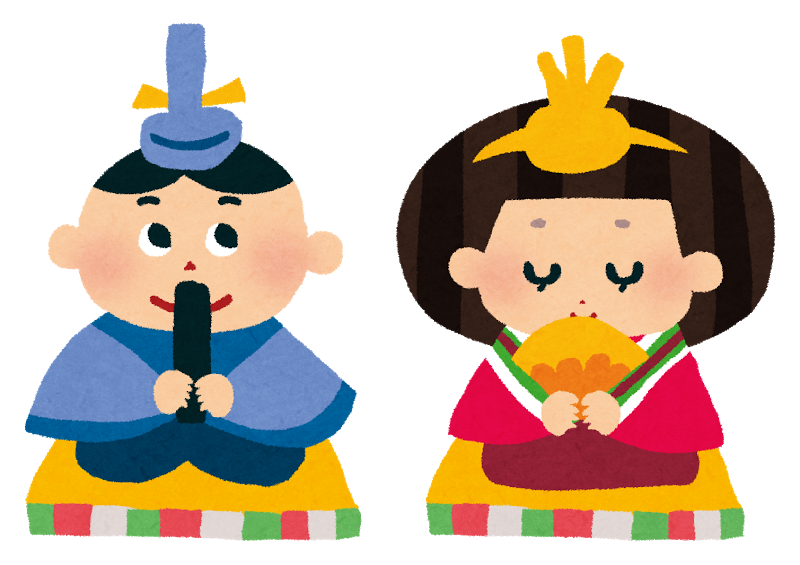 We set dates for important ceremonies based on 六曜 ( = rokuyou). As you can probably guess from the first kanji, there are six different categories of luck for a day. These “luck levels” are indicated on many Japanese calendars. •先勝 ( = senshou,senkachi,sakigachi,sakikachi) Make a quick decision and carry things out quickly. Try to do important things in the morning. Doing things from 2pm to 6pm will bring you bad luck. •先負 ( = senbu,senpu,senmake, sakimake) Bad luck in the morning and good luck from the afternoon. •仏滅 ( = butsumetsu) Bad luck all day long. Avoid having weddings or starting something new on these day. •大安 ( = taian) Good luck all day long. 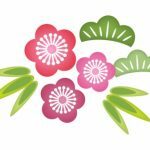 It is an ideal day for　婚礼 ( = konrei) wedding 、旅行 ( = ryokou) traveling、移転 ( = iten) moving, transferring、開店 ( = kaiten) starting your business, opening a store, etc. •赤口 ( = shakkou,jyakku,jakkou,sekiguchi) Bad luck except from 11am~1pm. = Kyou wa kichijitsu da. = It’s a “good luck day” today. = Procrastination is the thief of time. So 験を担ぐ ( = gen wo katsugu) is to be superstitious, to believe certain actions or objects bring you good luck or bad luck. = Kare wa gen wo katsui de katta shiai no toki no yunifoumu wo arawanakatta. = He didn’t wash the winning uniform believing in its good luck. Note :When you are winning, you don’t want to stop the winning and to keep your つき ( = tsuki) luck or つきを落とさない ( = Tsuki wo otosanai.) not to lose your luck, some people keep wearing the same thing without washing , not to shave or try to do the same thing as the day they won. 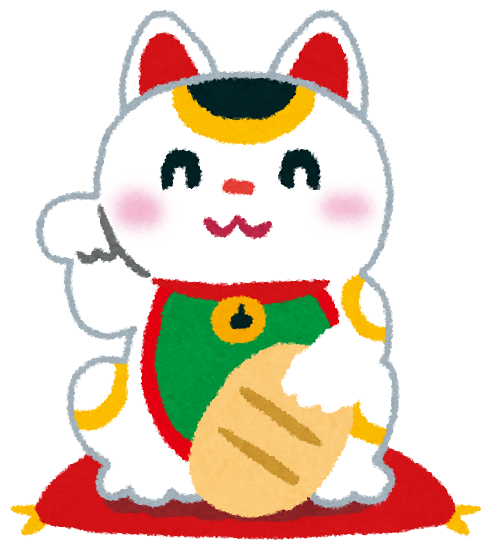 Now we’ll see what kind of objects or events will bring you good luck and bad luck. 鶴と亀 ( = tsuru to kame) are both symbols of a long life. = Cranes live for 1,000 years and tortoises live for 10,000 years. We use 松竹梅‘s design for happy occasions, such as weddings or New Year’s Day. Note: A lot of Japanese traditional restaurants use these names for the course names. • 櫛 ( = kushi) a comb Since it pronounces kushi, it reminds us of “苦死” suffering death, we avoid giving combs to others. • 鏡 ( = kagami) mirror Also you are not supposed to give a mirror as a gift especially to newly wed couples because mirrors break, 割れる ( = wareru) and it is 縁起が悪い ( = engi ga warui) bad luck. = It is a bad luck to break a mirror. = nana nen fukou ni naru. = You will be unlucky for seven years. = kekkon shiki ni okutte wa ikenai mono. 切れるもの ＋ 割れるもの ( = Kireru mono+Wareru mono) Something you cut with or breakable things. 刃物 ( = hamono) is the thing to “cut” = 切る ( = kiru) and we don’t want to cut the connection of two people. *鏡 ( = kagami) a mirror Giving a mirror is bad luck because it is breakable and implies that the relationship will break. = Omimai ni motte itte wa ikenai mono. = The things that you shouldn’t take when you visit someone in a hospital. Plants with roots: If you visit someone in the hospital, you shouldn’t take a plant in a flower pot because it has 根 ( = ne) roots and will 根づく ( = nezuku) take root and that means the plant will last a long time. Which means the sick person will stay in the hospital an even longer time. 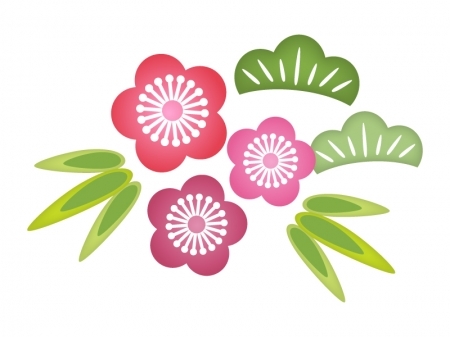 Also avoid taking シクラメン ( = shikuramen) cyclamen because it has a sound of シ(=shi) sounds like 死 ( = shi) death and 苦 ( = ku) pain and 椿 ( = tsubaki) camellia because the way it drops its flower is like the way people’s heads drop when they have been beheaded so it is 不吉 ( = fukitsu) ominous. Some of the actions or behaviors are taboos because they are related to the funeral. because that is the way we offer rice to the deceased at funerals. = Tabemono wo hashi to hashi de watasanai. = Do not to pass your food with your chopsticks to someone’s chopsticks directly. This is taboo because this is the way we take pieces of bone from the ashes of a cremated body and place them into an urn. Two people will pick up a bone with different sets of chopsticks and move it together. 北 ( = kita) means North and 枕 ( = makura) means a pillow. As I mentioned in my 節分 ( = setsubun) lesson, it is not a taboo but we tend to avoid sleeping facing north because of our Buddhist tradition of putting deceased people’s bodies facing north. = It is bad luck to mend your clothes before you leave the house in the morning. = Geta no hanao ga kireru. OK, now I will give you common examples of Japanese superstitions. = hide your thumb in a fist. = Oya no shinime ni aenai. = you won’t be able to be with your parents when they die. 2) 夜爪を切ると ( = yoru tsume wo kiruto.) Don’t cut your nails at night. →蛇が出る ( = Hebi ga deru.) a snake will come out. →おへそを隠しなさい ( = Oheso wo kakushinasai) hide your belly button. →Otherwise おへそを取られる ( = Oheso wo torareru. ), the thunder will take away your belly button. →牛になる ( = Ushi ni naru.) you will become a cow. →雨がふる ( = Ame ga furu.) it’s going to rain. →誰かが噂をしている（ = dareka ga uwasa wo shiteiru) It means someone is talking about you. When you keep sneezing, every number of sneeze has a different meaning. Such as badmouthing, good rumor, or someone falls in love with you, etc. It varies depending on the area and people. 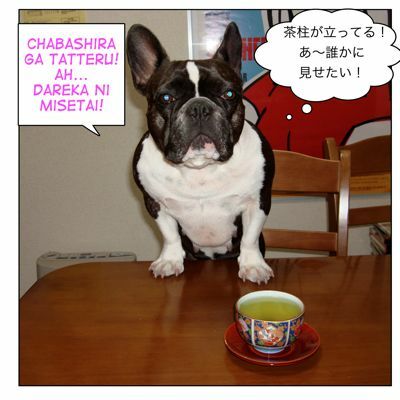 11) 食べ合わせ ( = tabeawase) Rules for what foods can be eaten together. → お腹をこわす ( = Onaka wo kowasu.) You will have loose bowels. Note : There are some other typical examples for the bad combination of food. 西瓜と鰻 ( = Suika to unagi.) water melon and grilled eel, etc. = Akinasu wa yome ni kuwasuna. = Don’t let your daughter-in-law eat an autumn eggplant. 1) Eggplants in autumn are very tasty and mother-in-laws didn’t want to share them with their daughter-in-laws. 2) Eggplants in autumn make women’s body’s colder so they are concerned that their daughter-in-law won’t have a baby. = mannaka bno hito ga ichiban hayaku shinu. = The middle one in the picture dies first. →早く治る ( = hayaku naoru) you will recover soon. 15) 丙午の嫁は ( = Hinoeuma no yome wa) Daughter-in-laws who are born in Hinoeuma year. = They will eat and kill their husband. The women who are born in the year are considered to be very aggressive. Older people used say that but I don’t hear this anymore… Just for your information. →嫁にいけない ( = yome ni ikenai) or 婚期が遅れる ( = konki ga okureru) (Your daughters) won’t be able to get married or will miss their chance to marry while they are of marriageable age. Please note that every regions might have different versions of these superstitions. Some of them in the list are very old fashioned but we have heard from our parents or grandparents when we were little. = Minasan no kuni niwa omoshiroi meishin ga arimasuka? Mata donna koto ga engi ga yokakutte donna koto ga engi ga warui desuka? = Do you have any interesting superstitions in your country? Also what kind of stuff do you think is for good luck or bad luck? Just came across your site and thought you might know of a superstition where children who loose their milk teeth throw the teeth over the house. I can’t remember if this is because it makes the new teeth grow strong. Do you know this superstition? I want to confirm it before I put it on the site. I’ve put a few on the site already but could only think of one that was good luck. Do you have any suggestions on any other ones I could add? Hi Laoise! Welcome to our site! Yes, when a child loses a baby tooth we throw them. Throw an upper baby tooth over the roof and throw lower milk teeth towards under the floor hoping the permanent teeth grow in the right direction. I am writing to you to ask you about whether this is believed to be a superstition in Japan..
Several years ago I went to Nara and unfortunately I accidentally stepped on a praying mantis!. I was wondering if there was a superstition related to this and would be grateful if you could let me know as I’m quite superstitious!. -_-; Thank you. I have never heard of superstitions of stepping praying mantis. No worries. 1) Is there a difference between using “subeki” and “subeshi”? Sensei, I know “tte” can be used in various contexts. I know it can be used as a substitute for “wa” and “to”. In this specific sentence, what is the usage it has? I feel it is used as a quotation mark and kind of imperative as in “say what is a good thing of good omen”, but of course I can’t be sure. 1) ~すべし is literal and usually used at the end of the sentences of aphoristic imperative. すべき is much more common to use. 2) Ah, OK, again we add っ before て in casual speech. Oh I understand sensei. Those three examples sensei provided really helped me as I am used to seeing sentences constructed in that manner, they really helped me. Thank you Maggiesensei for explaining things so clearly. Good to hear it’s clear now. Actually small っ is very tricky. It is just one small letter but it is difficult even for many people who have lived in Japan for a long time. I have a lesson of って when you quote but since I know you have been following the index order, just take a quick peek, OK? That’s my situation sensei. “tte” is very complicated for me. Sensei I do am following the index but I am ahead of this lesson by now, I mean, I already studied this lesson a while back. I already read the “tte” lesson as a matter of fact sensei, but even then I am still struggling to differentiate the meaning behind “tte” depending on sentence, and that is why I am treating each sentence case by case. Sorry sensei if I ask again for the meaning of “tte” in the future. “tte” just doesn’t seem to be my friend sometimes. I see. But don’t worry. You can ask me questions as much as you want until you and tte become good friends! You can always count on that! You two may fight here and there but I am sure you will be best friends eventually! Maggie, do you know what’s the unlucky number for Italians? By the way, I talked about the 立て箸 in my speech (Speech Contest 2011 in Chiyoda, Tokyo, before I left Japan). Wow! I will call you Miss Superstition from now. I had no idea you know this much! I am very impressed. Thank you so much for telling me all about interesting superstitions. I will check under my pillow before I sleep from now on. Yes, 亀 will bring good luck. Also in Hawaii, Honu=ウミガメ brings you happiness, I heard..
Is there a Japanese superstition that says you cannot celebrate a birthday or Mother’s Day earlier than the day it falls on or it is bad luck? No there isn’t. Very interesting! Where are you from? ＞＞I wanted to say “A number of Japanese supertitions are also present in Chinese superstition.